I was taking pictures of the tram and when I got home I saw that all three people were staring at my camera. At Bellevue in Zurich. The post for day 1, Friday, when I went to Mount Rigi, hasn’t been written yet. Today was a busy day, which is expected when you travel Steven Vance-style: efficiently (meaning you see a lot of stuff without wasting any time), alone, with a very good sense of what you want to do, where they are, and how you’ll get around. I’m staying at Hotel Bristol, which came up in an Orbitz search as being a decent place less than $100 per night – that’s hard in Zurich, and even harder if you want a place near the Hauptbahnhof (Hbf). I knew that’s where I would be coming and going a few times to get to Lucerne, the mountains, or to buy cheap (relatively) dinner. This morning, after eating a continental breakfast in the hotel, I walked a couple of blocks from the hotel to the Hbf – I’m measuring blocks in a Chicago-sense. It was about 4-5 minutes to the nearest station entrance to buy the ZurichCard. Getting the card was a no-brainer because for 24 CHF (Swiss Francs, about $25) you get a 24-hour public transit card and free entry to dozens of museums. It includes the city zone and the adjacent zones, including the airport. I have to leave for the airport tomorrow by 10 AM and I validated the card at 11 AM so I’m covered there. After checking out and riding the city’s two funiculars and single rack railway, I visited the tram museum and national museum (Landesmuseum). Add to that the dozens of trams and buses I rode to reach the hill transport and two museums. Consider that the cost of the train to the airport is 6.40 CHF, the tram museum is 12 CHF, and the Landesmuseum charges 10 CHF, I’d say I got more than my money’s worth. What’s really great about the ZurichCard is that you can purchase it at any of ticket vending machine, including the ones labeled “SBB CFF FFS”* that also sell national railway and supra-regional tickets. You have to remember to validate the card right before your first use, either at a ZVV (Zurich regional public transport union) ticket vending machine. My first transit trip this morning was on a fantastic double-articulated bus. That means it has three sections with five doors! These buses are only used on routes 31 and 33 in the city center, and they’re electric and silent, running on overhead trolley wire. The bus has the same priority and comfort as a tram, and multiple screens attached to the ceiling showing the next stop and its connections (transfers). The front two sections of a bi-articulated bus. It’s normally not possible to bring a bike on a bus or tram in Europe, except when the bus has been specially outfitted for the bike to be on the inside. Buses in Europe aren’t allowed to have bike racks on the front. The tram system in the city center is the perfect complement and support for having so little driving here. Some of the streets restrict driving, and other streets have only a single lane in one direction, or just two lanes, one in each direction. Many of the major intersections within a mile of the Hbf surprisingly have no traffic controls. Trams and buses load and unload passengers very fast because you can board through any door. “Winter mode” is enabled on many of the vehicles to keep passengers already on board more comfortable by opening doors at the stop only upon request (you push a button on the door). Streetfilms published a video in 2014 discussing how the city administration has capped the number of parking spaces across the city: if a new parking space is built, a parking space has to be removed in the city center. Driving in the city center is thus primarily for leaving your parking space for elsewhere in the city or region, or the reverse. Trips are extremely convenient by tram or trolley bus. Motorists are obliged to stop for people who want to cross the road in zebra crossings, and trams which are turning across the lanes. Then, unless a road sign or marking dictates the priority of a lane, the rule “yield to the motorist on your right” reigns. I never waited more than 7 minutes for a tram (I know because the countdown signs never exceeded 7 minutes for the route I was going to ride) and the average was probably closer to 4 minutes. It seems that a majority of the time trams run in exclusive right of way and traffic signals are set up to prioritize their movement. Transit signal priority isn’t a given in all cities with trams; in Amsterdam and Budapest it seemed the tram waited just as long for a “green” light as adjacent, same-direction motorists did. At the tram museum I talked to a staffer there who was pointing out features in a model created by a city task force which was investigating a potential U-bahn (underground) system for Zurich. He said that a couple of years ago the museum hosted an event to talk about whether the city was better off without the system. The consensus amongst the attendees was that the city was indeed better off without a subway because the trams have a higher frequency than what the subway would have had. Another point made was that the connections between trams are easier and faster than between other modes. Nevertheless, a few underground stations were built, but they aren’t subways. Two tracks, 21 and 22, carry the two routes of the Sihltal Zürich Uetliberg Bahn (SZU), One goes up the Uetliberg mountain in the city and the other serves the Sihl valley suburbs. There are also three underground tram stations away from the city center on line 7. Traffic on the local transit was lighter than yesterday. Many riders I saw today were headed to a hill to go sledding. 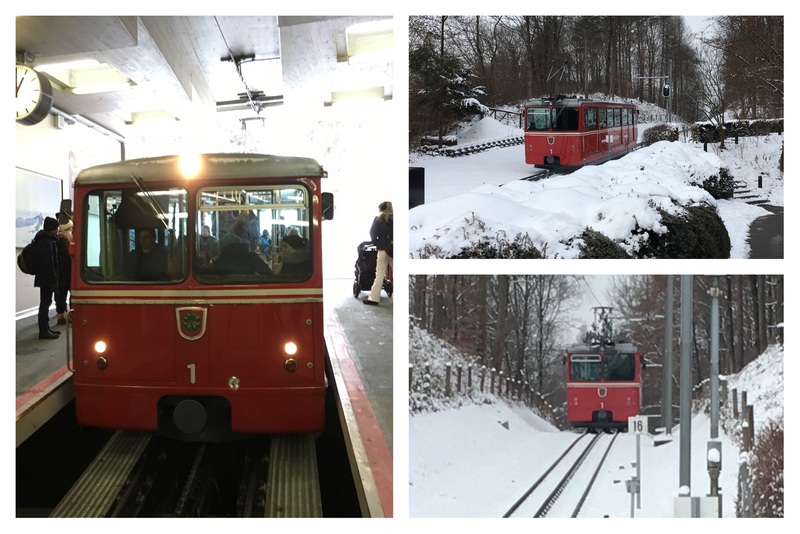 It might also be a coincidence that I rode all three hill-climbing funicular and rack railway lines, as well as the train that goes up “Mount Zurich” (870 meters; its real name is Uetliberg). The Dolderbahn is a rack (cog) railway that heads up the Adlisberg mountain from Römerhof to the Dolder recreation area. At least half of the passengers today were children going with their parents and friends to sled down a hill there. The last word on Zurich: It’s very expensive to eat here. I paid 11.50 CHF (about the same in USD) for a “döner box” which is something I paid about $5 in Rotterdam. A döner box is fast food. The cheap beer that went along with it was $5, which I could probably get for less than $2 in Rotterdam. * “SBB CFF FFS” is a set of three acronyms that when expanded mean “Swiss Federal Railways” in German, French, and Italian, respectively. It’s normally abbreviated to SBB – German is the most commonly spoken language in Switzerland. Each of the acronyms plus dot “ch” has its own website that loads the organization’s website in the respective language.